Masdevallia Orchid care is not as difficult as some other orchids. Being a cool growing orchid they prefer a cool moist position with filtered light. Brilliant colors from the many hybrids, and attractive flowers these are an excellent choice for the novice. Originally from Mexico, south through to Peru with over 300 species these wonderful orchids mainly come from the mountains so are cool growers. Popular with orchid enthusiasts many hybrids are available, generally with lovely flower form and colour, but also with a tendency to be even easier to grow then the species. In good filtered light and in a moist yet not wet growing medium these are an easy care plant. 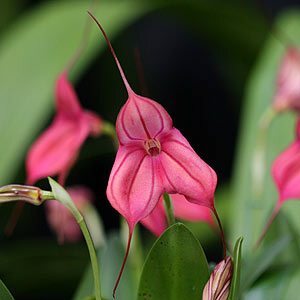 Although these are a varied group to generalise, Masdevallia Orchids are a mostly cool growing orchid species endemic to the high mountains of South & Central America. You could measure light or you could look at the natural growing conditions, good filtered light with good airflow is a guide. These are an Orchid that do require a little more moisture than others, they do not store water as well as some as they do not have pseudo bulbs..
Every year or second year as a guide, the moisture breaks down the growing medium making this essential to maintain that balance between moisture and drainage. A weak liquid fertilizer often during the growing season seems to work well. 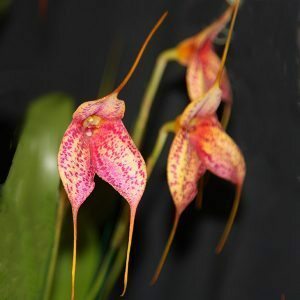 Some spectacular new Masdevallia Orchid hybrids are being released , including yellow, purple, red, orange and pink varieties. Cool night temperature is essential, protection from summer heat and good humidity and air movement are the keys to successful growth. Like all orchids Masdevallias thrive on regular fertilising and in a suitable potting mix. We suggest a specialist orchid fertilizer. And remember that they do prefer a shaded position. Most problems relate to over potting and too much light. This can cause the foliage to brown. Other problems occur from lack of moisture, and poor drainage. Overwatering is a problem, soggy soil cause the growing medium to sour and this leads to root problems.